Pete (that's our name for the camel we found at The Giraffe House) is a Bactrian camel - meaning that this fellow is of the two-humped variety. The Bactrian Camel is apparently one of only two species of camel, the other being the Arabian, or Dromedary, camel. What I found interesting is that there are only very few camels in the world that are not domesticated. The weirdest thing of all is that it seems as though the camel is the only land mammel able to drink salt water without suffering ill effects! 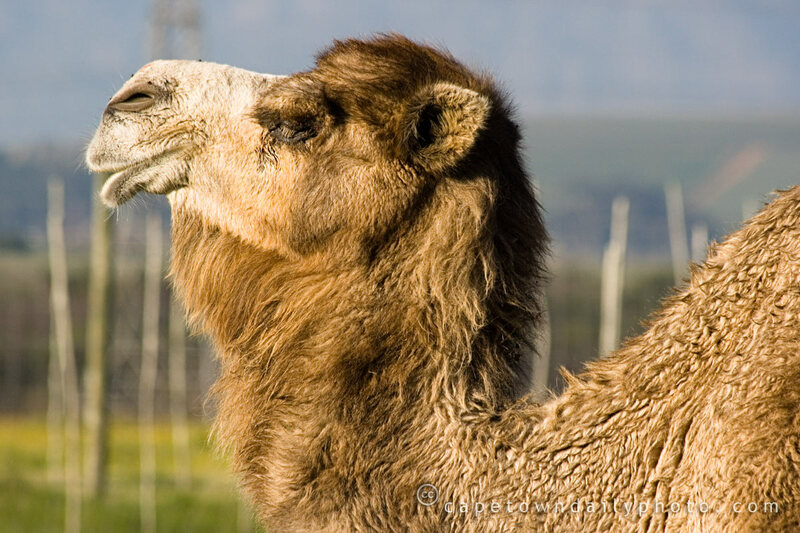 One of the fun things you can do in Cape Town is to take a ride on a camel: Imhoff Farm offers short rides around the farm as well as a 2-hour-long "Bush Ride", which I hear is loads of fun. If you've ever taken a ride on the Imhoff Farm camels, please leave a comment and tell us what your experience was like (as well as any tips that one may find useful on a 2-hour-long camel ride!). The only camel ride Kerry-Anne and I have taken was a short one on an Arabian camel while on honeymoon many years ago. Posted in Activities and tagged animals, leisure on Tuesday, 28 July, 2009 by Paul.